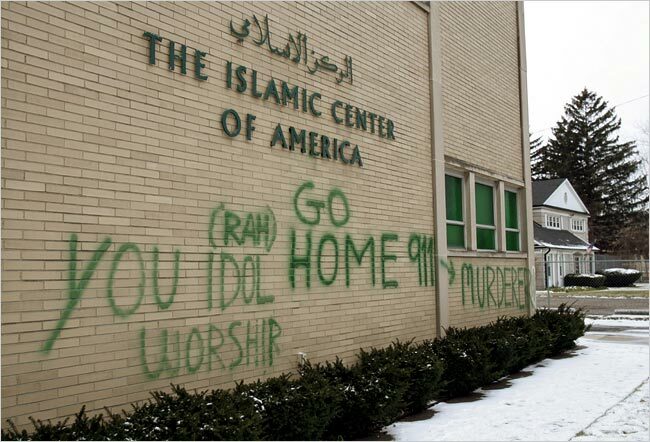 DEARBORN, Mich. — Twice recently, vandals have shattered windows at three mosques and a dozen businesses popular among Shiite Muslims along Warren Avenue, the spine of the Arab community here. Escalating tensions between Sunnis and Shiites across the Middle East are rippling through some American Muslim communities, and have been blamed for events including vandalism and student confrontations. Political splits between those for and against the American invasion of Iraq fuel some of the animosity, but it is also a fight among Muslims about who represents Islam. Long before the vandalism in Dearborn and Detroit, feuds had been simmering on some college campuses. Some Shiite students said they had faced repeated discrimination, like being formally barred by the Sunni-dominated Muslim Student Association from leading prayers. At numerous universities, Shiite students have broken away from the association, which has dozens of chapters nationwide, to form their own groups. “A microcosm of what is happening in Iraq happened in New Jersey because people couldn’t put aside their differences,” said Sami Elmansoury, a Sunni Muslim and former vice president of the Islamic Society at Rutgers University, where there has been a sharp dispute. Though the war in Iraq is one crucial cause, some students and experts on sectarianism also attribute the fissure to the significant growth in the Muslim American population over the past few decades. Yeah, I guess that idea of fighting them over there didn't work so well. They're now fighting each other over here.